The Call for Papers & Posters is now closed ! The Congress organisers invite all interested professionals, practitioners, researchers, public and private institutions, as well as international networks and initiatives related to agritourism to send their paper or poster referring to one of the Key Themes of the congress or to one of the Special Sessions. 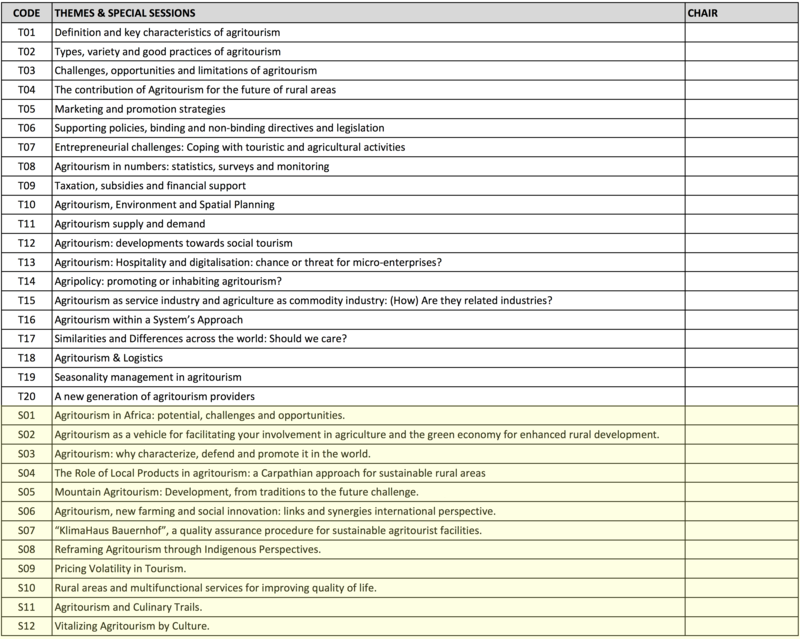 We welcome thematic proposals deriving from all kind of disciplines and concerning both basic or applied research.The link to the concept of Agritourism needs to be evident and you are encouraged to keep in mind the criteria listed below before submitting your proposal. We welcome also contributions on interesting practical experiences. Please submit proposals for papers or posters in the form of 250-word abstract in English (text only). Authors are invited to submit original papers that are not being considered for publication in any other events. All Congress sessions will be held in English, therefore all submissions must be in English. A submitter must be (co-)author of the submission and (one of) the presenting author(s). All correspondence will be sent to the submitter. There is a maximum of 2 submissions and 2 presentations per person. All participants need to register and pay the due registration fee. Registration is effective after full receipt of payment. Only registered authors will be included in the official programme. By submitting an abstract, the paper and/or a poster, you are granting the LOC permission to publish it in the conference proceedings and to disseminate it also electronically. Presentations could be audio and video recorded and made available to conference attendees after the congress. Should you have any questions, please contact the Local Organizing Committee. Following a review of the LOC and/or the Congress Advisory Board, the organizers will decide on acceptance or rejection of the paper or poster. Note: the LOC has the right to reject submissions from the congress or move submissions to another theme or another type of session. We urge participants to consider presenting their work as posters; it’s a great opportunity to obtain interesting and valuable feedback on ongoing research from a knowledgeable crowd at the congress. We are looking for submissions of posters, describing ongoing research and practices, exciting new projects, and encouraging preliminary results. Accepted posters will be displayed for the entire conference on poster boards. Presenters are required to be present at the specific time in order to take part in the discussion and exchange views with other colleagues. Presenters should prepare the best material (visually appealing and succinct) that effectively communicates research problem, techniques, results, and what is novel and important about the work. All posters papers must be in English and all figures, photographs, and diagrams to be used for poster presentation must be clearly discernible and tidy. The presented posters will be digitally archived and made publicly available after the conference. All papers have been assigned discussants. As a discussant, you provide feedback on the paper and presentation and kick off the general discussion. As a rule, there is a maximum of 5 minutes for the discussant. Papers assigned to you, can be accessed through the online programme if the paper has been made publically available by the author(s). If a paper has not been uploaded, please contact the author and/or the special session conveners directly for access. All sessions have been assigned chairs. The chair’s main job is to allow all presenters the allotted time to present their work. Please, if not necessary, do not change the order of presentation. In all sessions, the chair also makes sure the discussant has the opportunity to reflect on the presentation and paper. Every Presentation room will be equipped with a computer already connected to a screen to project your presentation and to internet. All computers are equipped with a USB port as well as Acrobat Reader and Microsoft Power Point. Please bring your presentations in these file formats already on a USB flash drive. As a guideline, the following schedule can be used: 5 papers in 120 minutes: 15 minutes presentation + 5 minutes discussion + 20 minutes for general discussion. All presentations will be assigned a discussant. All Sessions have a minimum of 4 and maximum of 6 submitted papers. In case a proposed Special Session does not meet this condition, it will be programmed differently.